The United States Secretary of State (commonly abbreviated as SecState) is the head of the United States Department of State. This department deals with foreign affairs. The Secretary is a member of the President's Cabinet. This person is the highest-ranking cabinet secretary both in line of succession and order of precedence. The President chooses the person he or she wants to be Secretary of the State. The United States Senate must agree with this choice for the person to become the Secretary of State. 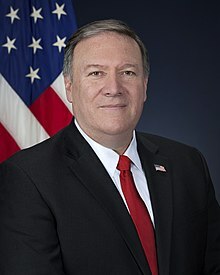 Mike Pompeo of Kansas is the current Secretary of State since April 2018. He became Secretary when Rex Tillerson was fired by President Donald Trump. The position of Secretary of State was created in April 6, 1789. Thomas Jefferson was the first Secretary. The Presidential order of succession lists the Secretary of State as the 4th person in line if something happens to the President. Managing the commissions of people the President puts into office. The following are the responsibilities of the Secretary of State. These were added to the duties over time. In control of the United States Department of State and the United States Foreign Service. Adviser to the President on matters dealing with other countries. This includes choosing diplomats to other nations and dealing with diplomats from other nations. Takes part in high-level negotiations with other countries. The Secretary deals with both single nations and international conferences or organizations. This includes the negotiation of international treaties. In control of the direction, coordination, and supervision of activities of the U.S. Government in other countries when more than one government department is involved. Support U.S. citizens living or traveling in other countries. This includes information, passports, visas and other services. Supervises the United States immigration policy in other countries. Communicates problems dealing with the United States foreign policy to Congress and to U.S. citizens. ↑ "Biographies of the Secretaries of State: Henry A. (Heinz Alfred) Kissinger (1923–)". U.S. Department of State - Office of the Historian. ↑ "Biographies of the Secretaries of State: Cyrus Roberts Vance (1917–2002)". U.S. Department of State - Office of the Historian. ↑ "Biographies of the Secretaries of State: Edmund Sixtus Muskie (1914–1996)". U.S. Department of State - Office of the Historian. ↑ "Biographies of the Secretaries of State: Alexander Meigs Haig Jr. (1924–2010)". U.S. Department of State - Office of the Historian. ↑ "Biographies of the Secretaries of State: George Pratt Shultz (1920–)". U.S. Department of State - Office of the Historian. ↑ "Biographies of the Secretaries of State: James Addison Baker III (1930–)". U.S. Department of State - Office of the Historian. ↑ "Biographies of the Secretaries of State: Lawrence Sidney Eagleburger (1930–2011)". U.S. Department of State - Office of the Historian. Served as Acting Secretary of State, Aug 23-Dec 8, 1992. ↑ "Biographies of the Secretaries of State: Lawrence Sidney Eagleburger (1930–2011)". U.S. Department of State - Office of the Historian. ↑ 10.0 10.1 and, Thomas L. Friedman. "Clinton Rounds Out State Dept. Team". nytimes.com. Retrieved 14 March 2018. ↑ "Biographies of the Secretaries of State: Warren Minor Christopher (1925–2011)". U.S. Department of State - Office of the Historian. ↑ "Biographies of the Secretaries of State: Madeleine Korbel Albright (1937–)". U.S. Department of State - Office of the Historian. ↑ "Biographies of the Secretaries of State: Colin Luther Powell (1937–)". U.S. Department of State - Office of the Historian. ↑ "Biographies of the Secretaries of State: Condoleezza Rice (1954–)". U.S. Department of State - Office of the Historian. ↑ "Biographies of the Secretaries of State: Condoleezza Rice (1954–)". U.S. Department of State - Office of the Historian. Under Secretary for Political Affairs William J. Burns served as Acting Secretary of State, January 20-21, 2009. ↑ "Biographies of the Secretaries of State: Hillary Rodham Clinton (1947–)". U.S. Department of State - Office of the Historian. ↑ "John Forbes Kerry (1943–)". U.S. Department of State - Office of the Historian. ↑ Herman, Steve. "Career Diplomat Becomes Acting Secretary of State with Trump Inauguration". voanews.com. Retrieved 14 March 2018. ↑ News, ABC. "ABC News". ABC News. Retrieved 14 March 2018. ↑ "Under Secretary of State Shannon meets Tillerson: U.S. official". 19 January 2017. Retrieved 14 March 2018 – via Reuters. This page was last changed on 25 August 2018, at 06:30.